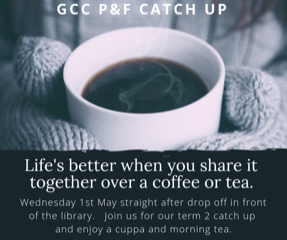 The last P and F Catch Up morning tea was such a success that another one is being held on Wednesday 1 May straight after drop off. Join other parents in front of the library for morning tea and a good chat. Please mark this in your calendar now as this is the last Eagle before the morning tea. This entry was posted in P and F on April 4, 2019 by sandy.